I agree with most of the opinions that here is way to many characters and way to much filler in most of these books if I haven't got so far into them I would quit listening but heard the author that finished the series does a better job. Wizards first rule series was much better. 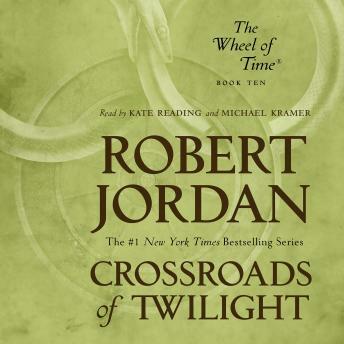 "Cross Roads of Twilight" was the ABSOLUTE WORST book in this series so far! Almost devoid of action and filled with stupid detail of what the women are wearing and just useless dialog fluff. The major thing was the cleaning of Sidene, which you would think deserved a chapter or 4 on how the Ashamen and maybe even the male Forsaken reacted to it, not to mention how Rand felt, but NOTHING! It's mostly about very boring Aisedi (sp?) banter, which was useless. I'm starting to think that he took a break and had his wife write this one, not that I'm a misogynist, far from it, but it's just filled with feminine blather about what the female characters are wearing and hardly any good action sequences. He stated that in past books, he had his wife check the entire manuscript. I really hope that "Knife of Dreams" is better. From the below reviews about Michaels narrating, I think that he was trying to offset Kate's feminine detail with a more masculine "just the facts" approach, not that I agree with it. In "Knife of Dreams", it seems he's coming to life a bit more, which is good. Skip this book and you won't be lost at all, just read a quick synopsis and save yourself a lot of time, some money and a lot of frustration! Love the story and by this time anyone will work their way through this novel and the next however I have to say it idoes not stand alone. It is simply a continuation of the story with a greater affinity towards character development which makes you question your former negative opinions of key characters in the previous novels. I don't know why anyone in their right mind would give this book a one star. This book was really good. I would say it is one of the better books. It wasn't as slow as as some made it out to be. Of course there were some parts but that has to be expected. The narrators were great. One commented that Cramer sounded monotone like he was tired. I disagree with that. He did an excellent job as,well as Kate Reading. Great series, great book. Don't take my word for, check it out for yourself. I love this series. Amazing! *THIS REVIEW CONTAINS SPOILERS* Let me start by saying I am not quite finished with this book yet. I listen to them at work and while I'm driving, so I'll probably finish it today. I see a lot of people feel this is book is basically fluff, and I understand the feeling. We jump around so much that it feels like no one plot gets very far or accomplishes anything. I think the reason he did this is because Rand cleansing the source was such a big deal, and Jordan wanted to show how everyone across the world reacted to it. Honestly, I was looking forward to the reactions, but I never really got the ones I wanted. I wanted the Asha'man to feel it and react, but we didn't really get much there. We had way more female characters freaking out over it when the Asha'man should have been absolutely stunned and thrilled. Yet we basically get nothing from them. The only thing I've found actually frustrating is right when a character has something important to say, Jordan will draw out the wait before you actually get to hear what is to be said. He'll talk about clothes, or the rank of soldiers down a line, or some other nonsense with the apparent attempt of creating suspense. It's just...silly. The last thing I have to say is regarding Kramer. I seriously feel like he's getting bored with the books. He read almost everything in the same flat/bored monotone no matter who was speaking or what they were speaking about. Kramer has never been a favorite of mine considering he can be talking about someone's grief or death in the same "matter of fact" tone and style as if he were talking about setting the table for dinner. It's a bit annoying. The accent he gives the Seanchan is also terrible. It makes me cringe. The narrators should get together and actually listen to one another. Kate is amazing as always. I just wish she'd make up her mind about how she's going to pronounce certain names. This book has ME at a crossroads. Do I continue? Can I possibly stand any more of this interminable dragging along? This book is my least favorite of the series so far. This book was a total waste of time. I love the series, but each book seems to have less substance than the one before. Finally, in Book 9, something actually happened and I was looking forward to hearing this one. However, this book seems to be made up entirely of filler. Most of the book takes place at the same time as the events described in Book 9. At the end, there is only one minor advancement in one of the character's situations. If you just read Book 11 and skipped this one, I seriously doubt that you would miss anything of import. Far too much detail. The writer goes on and on about the character's thoughts and motives but there is no action...no resolution...no story. The entire thing is very disjointed and difficult to follow. If you're looking for something enjoyable to occupy your mind while you relax or drive down the road this is not it. This will put you to sleep faster than the highway.